For a moment the Wabbit thought the caffè was deserted. But he wheeled around and saw three Roman soldiers drinking Roman Cola. The Wabbit was getting used to meeting his enemies and took the bull by the horns. "Good Servants of the Republic. What pray, are your names?" "I am Poobus," said one Roman, "I am Bummus," said another. "And I am Smellius," said the third soldier. The Wabbit suppressed a grin. "I am Wabbitus and I am employed by Provincial Governor Cuniculus. He implores all citizens to unmask and bring to justice, the Drink Thief." "Of what drink do you speak?" said a soldier. "Wabbit’s Cola, future drink of the people," said the Wabbit. "I prefer Roman Cola," said the soldier and the others shook their heads at the thought of a different Cola from Roman Cola. "You’ll be honourably mentioned at Senate," said the Wabbit with his paws crossed. "In that case I did see a strange one with the Cola," said a Roman soldier. "Went to the same outfitter as you by the looks of it," said another. "Made to measure," said another. “Really," said the Wabbit. "A snappy dresser! You have been most helpful." A soldier dug another in the ribs and pointed at the Wabbit. "If you're such a Roman, Wabitus, then riddle me this," he chuckled. "OK," said the Wabbit. "When was Rome built?" asked the soldier. "At night," replied the Wabbit. The three soldiers looked at him in puzzlement. 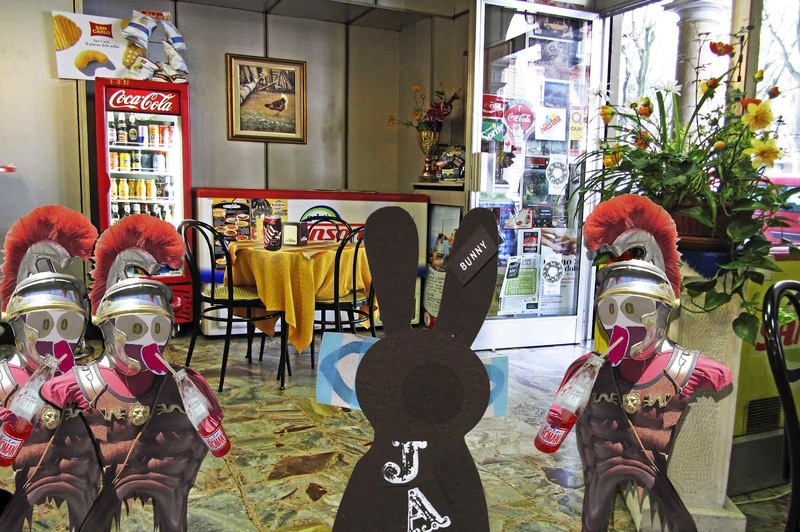 "Well Rome wasn’t built in the day," quipped the Wabbit and he hopped very quickly out.